Company vehicles such as lorries and vans can be seen in large numbers on British roads every day of the year. Lorries and other heavy goods vehicles (HGVs) play a vital role for thousands of UK businesses, helping to transport goods and keep their operations running smoothly 24 hours a day. Although lorry accidents make up a relatively small percentage of accidents that occur on UK roads, the injuries sustained in accidents involving lorries and other HGVs are often serious. This is not surprising given the sheer size and weight of these vehicles and the subsequent force of the impact that they can cause when crashing into other vehicles or structures. 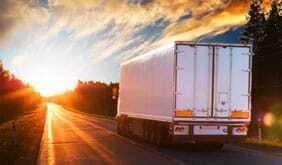 Lorry drivers often work long hours covering large distances, which can make them prone to fatigue-related accidents. Road accidents where driver fatigue has been a contributing factor, including those involving lorry and HGV drivers, account for up to 25% of all serious and fatal road traffic accidents. To help combat driver fatigue and minimise the risk of accidents, lorry drivers and the companies they work for are regulated by both UK and EU laws. This includes the EU Drivers Hours Rules and the Working Time Regulations which set limits on the number of driving hours that can be worked daily, weekly and fortnightly. They also impose minimum rest periods that must be taken by lorry drivers. Can I make a claim for a lorry accident? Whether you were the lorry driver, a pedestrian or another motorist involved in the accident, if it was not your fault, you should be entitled to make a road accident compensation claim. If you are a lorry driver that has been involved in a collision with another vehicle, and the driver of this other vehicle was a fault, you would be able to claim against their insurance company. Whether you drive a lorry, car, bus or a motorbike, the general principles are the same. As an employee, you may also be entitled to make a personal injury claim against your employer if the accident was caused by their negligence. This could be the case if your accident has been caused by a poorly maintained vehicle or you have been made to drive without adequate rest periods. Another example of potential employer negligence are accidents caused by an incorrectly loaded lorry, such as too much weight or an unstable load. If you are a driver, passenger or pedestrian that has had an accident with a lorry or HGV, and the driver of this vehicle was at fault, you would be able to make a compensation claim against either the driver or the company that he or she works for. Over the years, the number of lorry accidents on British roads has increased. These accidents can result in serious injuries to those involved, as well as possible fatalities. If you have been involved in a lorry accident that was not your fault, our injury lawyers can assist you in making a claim for compensation. Providing the accident happened within the last 3 years and you suffered an injury or injuries, you would stand a good chance of making a successful claim. Our solicitors have helped thousands of people make personal injury claims as a result of lorry and other road accidents. We provide a genuine no win no fee service, so you can pursue the compensation that you rightfully deserve without the worrying financial risk of legal bills if your case is unsuccessful. To find out more about making a lorry accident compensation claim, contact us today for a free claim assessment. Our experienced solicitors can tell you within minutes if you can make a claim, and can let you know how much compensation you could be entitled to.